This Ice Cube 20 light LED 180cm drop spiral pendant light in polished chrome is modern, stylish and energy efficient. Featuring a 45cm mirror chrome ceiling plate and twenty sculpted ice cube glass shades, each fitted with a warm white 3w LED module. The shades are suspended by fine wire cables that terminate at different levels creating a 180cm tall spiral. A bright long drop pendant light suitable for any hallway, above a staircase, living area or dining room. The twenty sculptured glass shades spiral elegantly down from the circular chrome finish ceiling plate and bring this modern chandelier to life. Boasting the very latest in energy efficient LED technology, this feature spiral pendant gives 3000 lumens of warm white light yet consumes just 60w of electricity. Please note that this fitting has a 180cm drop and requires a high ceiling to be shown off at its best; please ensure that it is suitable prior to ordering. Other products in the Ice Cube LED lighting range can be viewed below and include various multi drop spiral pendants and wall lights. 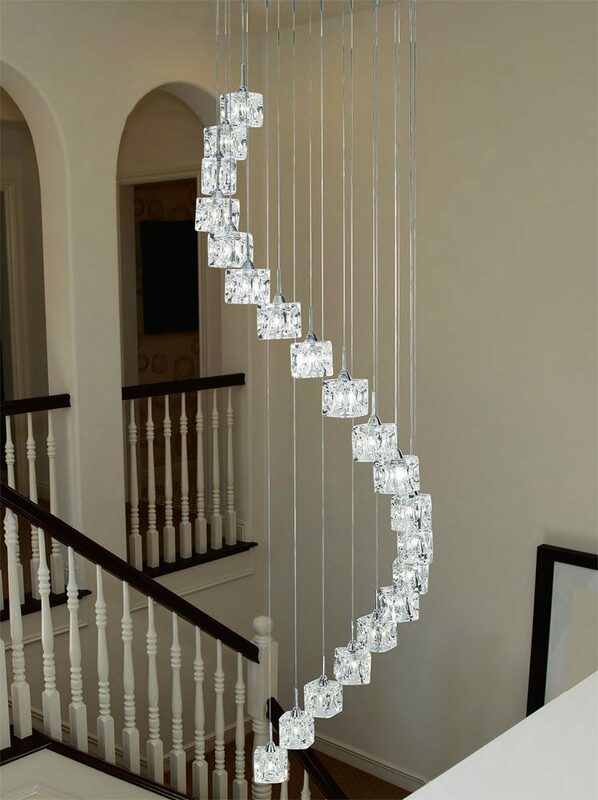 Supplied by Searchlight who manufacture some of the best traditional and modern classic designs such as the Ice Cube 20 light LED 180cm drop spiral pendant light in polished chrome you see here.